Note: This book has undergone a bunch of cover changes, but this is the most current one as of this writing. Review – KM Shea has risen to become one of my favorite writers – though I guess technically after MBRC she was pretty much, but as I’m reading her back catalog it’s been cemented. 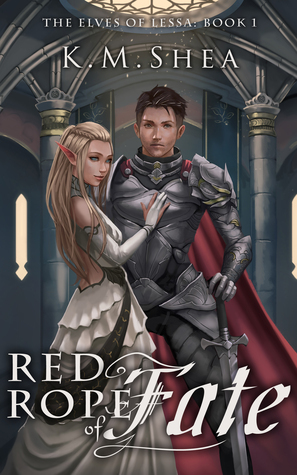 While this is a fantasy romance, the romance part isn’t the biggest – Shea spends time showing us how despite the fact they can communicate Tari and Arion start off on the same uneven ground as the other bound pairs. Mystery, ignorance and prejudice has kept the humans and Lesser Elves from truly understanding each others’ cultures and being able to communicate doesn’t actually help them as much as the scholars seem to think it should. Arion doesn’t quite get that for Elves they may be “touchy-feely” but that doesn’t mean instant intimacy. Tari doesn’t understand that humans are truly the pettiest creatures ever so taking them on face value can sometimes be problematic. Watching as the two unfold what it means to be Bonded is the best part. Yes there is the mystery of who wants them…well probably not dead given who the villain turns out to be, but at the very least, no longer Bonded. But guys it’s fun reading as Tari drinks the entire Patrol unit under the table or Arion fails dismally at flirting (several times). The both of them really just…make an impression. Sometimes good. Sometimes bad. But always amusing. The pace was uneven at times, seeming to struggle to link all the fun world bits with the resolutions of the bad guys’ varied plots (which were, at best, not well thought out). However on balance this is a fun engaging read that will lighten your heart.